Discussion in 'BMX & Dirt Jumping' started by c2001, May 9, 2008. Spread the word and if you're coming to Teva Games (which rules), come on down and schralp it up. 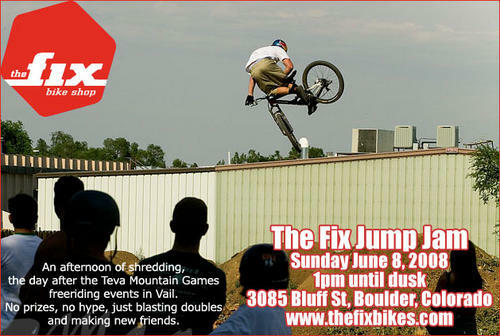 Fix Bikes in Boulder, Colorado is stoked to announce our annual Fix Jump Jam. This year we'll be shredding our backyard jumps in Boulder on Sunday, June 8, 2008, the day after the Freeride events at the Teva Mountain Games. 1pm until dusk. We're stoked to invite everyone together for an afternoon of blasting doubles and making new friends. Our jumps are running great right now and there are lines for all sizes, including two pumptracks to be tackled. 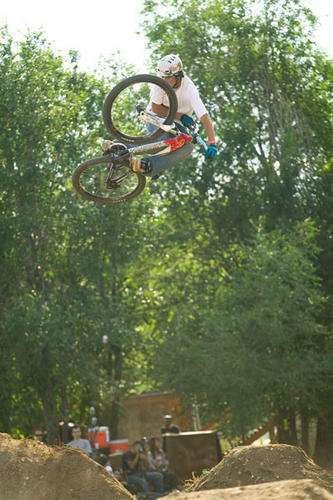 The jumps are located behind our shop at 3085 Bluff Street, Boulder, CO 80301 and are open to anyone to ride. Waivers must be signed and riders under 18 need the signature of a parent or guardian. For more information visit www.thefixbikes.com or call 1.866.790.2453 - SEE YA THERE! the jumps will still be there. stop by if you're in town. last year was phun, this year will be even phunner. Sunset is looking pretty dope right now. What were you in town for? Next time you come back, hit me up and we'll go hit some spots and do some sweet jumps.